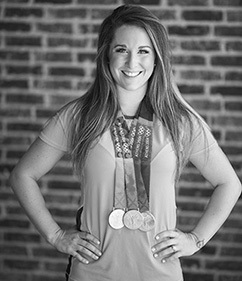 Carly Patterson captured the heart of the nation when she won the All-Around Gold Medal in Women’s Gymnastics at the 2004 Olympics. She was the first American woman to win the title in 20 years, also taking home silver medals for balance beam, and the Women’s team competition. She was also the first woman ever to win the All-Around Gold Medal in Women’s Gymnastics in a non-boycotted Olympics.